HomeCOMMENTARYFailed Brexit? No Taxation Without Representation! This is very kind of him and 100 percent correct, but I take no pleasure in being right about how the establishment elite and their lickspittle mates in the MSM would never allow us to leave the undemocratic EU. Right from the beginning, when the MSM were scrambling to get guests outside Westminster to comment on the result they never saw coming, they decided that the will of the people had to be defeated. I said at the time that most politicians, commentators and “political experts” had already packed their suitcases for their holidays in Tuscany! The combined efforts of the governor of the Bank of England, the globalists, big business and the whole political class combined with Operation Fear could never be beaten, could it? Even Barack Obama came over and gave a speech, written by Cameron, but we the people gave this out-of-touch political class the biggest bloody nose in British history, and it felt brilliant didn’t it? Independence day was a great day, but even on that momentous and historic day, I said that I thought they would never let us get away with our victory, and I am sorry to say I was proved right. Right from the outset, they started attacking us, the people, forgetting of course that politicians are our servants, not our masters. Cowardly Cameron, despite insisting in his £9 MILLION-pound leaflets that were delivered to every house in the UK that “This is your decision. The Government will implement what you decide,” instead resigned. By default this allowed arch remainer Theresa May to slip into Number 10. 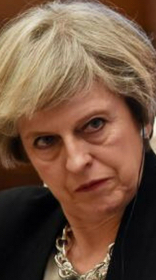 Her mantra of “Brexit means Brexit” was just a way of deceiving the UK public. She and most of her cabinet colleagues and indeed two-thirds of the Westminster swamp never wanted us to leave. 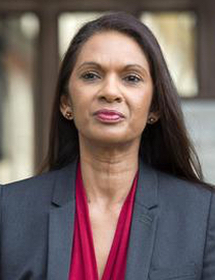 Out of nowhere emerged hyper-wealthy Gina Miller (pictured), who got the courts to declare that it would be Parliament, not the PM, who would decide when we left the EU. This was crucial to the betrayal, as when we took part in the largest democratic decision in our history, we all believed that what we decided would be acted on as Cameron had declared. But no, the self-serving pigs had seized back the power. This is the reason we have had the pantomime of the last two and a half years culminating in the serial votes in the Commons of the last few weeks. The broadcasters on Sky and the BBC have almost been orgasmic over every twist and turn, but I and many others have been bored rigid with this choreographed affront to democracy. Theresa May was never up to the job. Who in their right mind would accept a divorce deal where we agree to pay £39 BILLION before we even knew the terms of the deal, or before we were allowed to set up trade deals of our own. week when she actually voted that way. But Theresa the Appeaser is not the only hypocrite in the Westminster swamp. The majority of MPs on all sides stood in the last election on a platform of respecting the decision of the referendum, and they have completely betrayed their constituents. They have all put their miserable careers before the needs of the Nation, and as a result, they have demolished our democracy. I’m not going to fall into the trap of talking about every twist and turn of this Brexit betrayal as life is too short, and all we need to know is that we the people have been royally shafted both by the EU and our own politicians, aided and abetted by the MSM, and Sky News and the BBC in particular. Well, if there is a delay, then there will probably be EU elections, which I confidently predict will be a landslide to UKIP and Nigel Farage’s new Brexit party which, of course, will give the establishment a bloody nose again. However, we will still remain in the EU and life will continue the same. 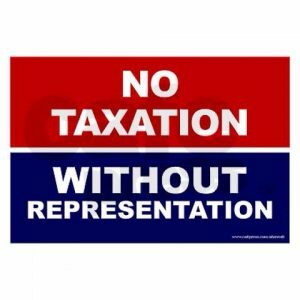 I feel though, to effect real change, we need to adopt the slogan of the American revolution of 1765 and state clearly “No taxation without Representation”. suggesting that we stop paying our taxes, especially the broadcasting poll tax, the BBC licence fee, but we need to go, further, don’t we? The self-servers keep talking about how democracy is broken. However, as far as I can see, society itself is broken. Normal people who don’t have columns to pontificate in or radio shows to spout off on only have one way to express their views and that is by the ballot box, and if the elite are now clearly going to ignore that, then they are lighting the fuse on a powder keg. Make no mistake: people are not bored or apathetic about Brexit and this betrayal they are angry. Very, very angry. What a pity the MSM cannot see outside of their Perspex temporary studios and see and reflect that anger throughout our “SEPTIC” isle. They wont of course because they are complicit in this betrayal.